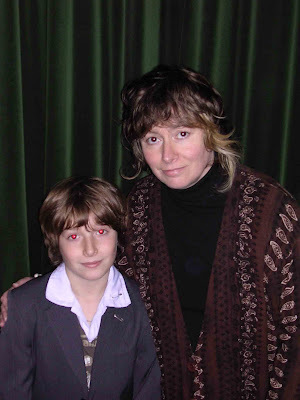 Is this how you imagined us? 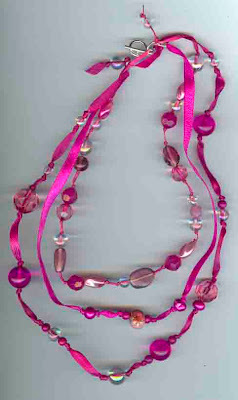 After our call for pink beads, a couple arrived in the post, Thank You Gretel !! 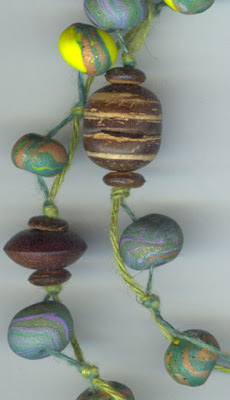 and another creative blogging friend, Caroline, did a bead swap with Toby. 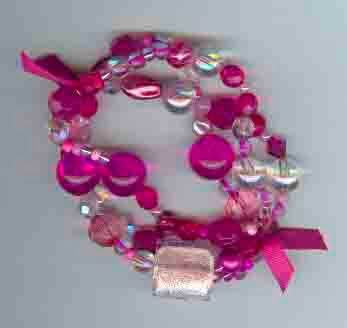 We searched the shops and internet for more, also for pink ribbons. 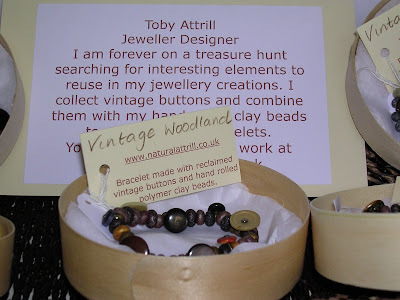 Armed with all these treasures Toby sat down to design a necklace for Chrissie at 'Hat Therapy', she commissioned him to make something similar to the brown one Karen bought, see post 2nd April, but in pinks, and also a chunky bracelet, in matching colours, on 3 strands of elastic. 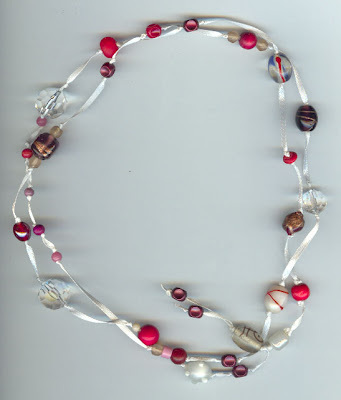 Then came the problems, so many of the lovely pink beads he collected had holes too small for the ribbons to thread through (Chrissie specified the width of ribbon she wanted), and the 3 strands of elastic, together, were too big to fit through most of his beads as well. 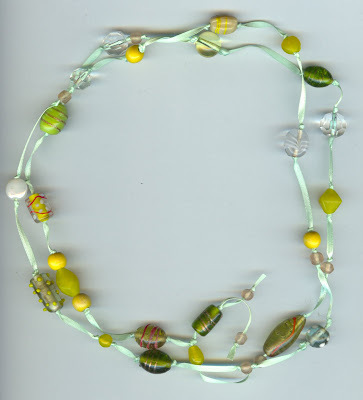 Much to Toby's credit, he sorted the problems, finding alternative beads and redesigning the jewellery to meet the specifications. 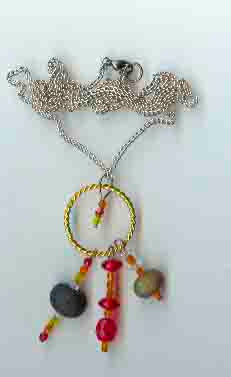 Today he delivered them, ready for Chrissie to display in her lovely shop, alongside her beautiful handmade hats. 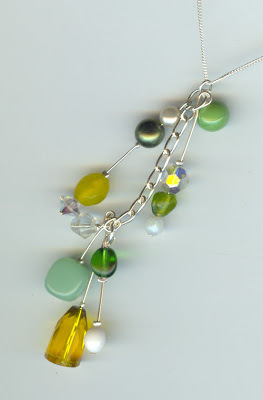 Making jewellery, or anything, to commission, is very different to designing somthing you fancy, then selling it. It's great knowing you'll get paid, but takes alot of skill to fulfill someone elses wishes. 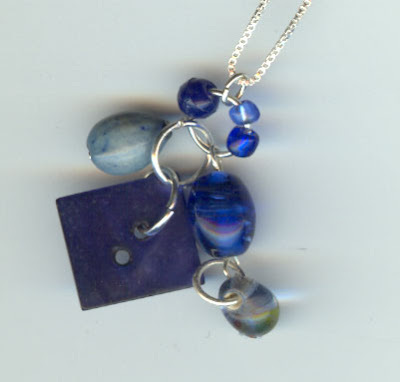 Toby also has 2 repair jobs to do, and is in discussion with an illustrator friend about making a red necklace and bracelet, so he is busy busy busy! 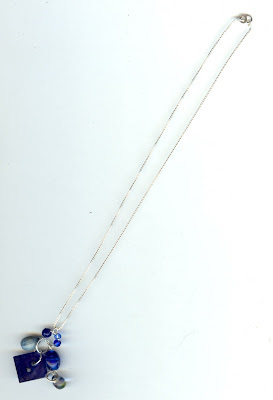 5 Charm necklaces for sale! 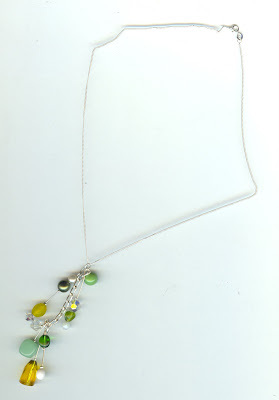 Even if you dont want to buy one, please let us know what you think, it is always good to read your comments! 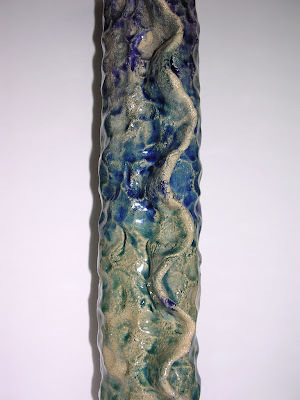 This is my laceypot. 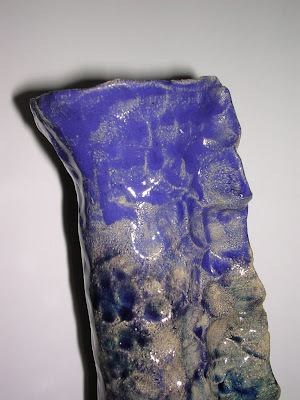 It is made from stoneware buff clay, and glazed with persian crackle glaze (the bluey one), Manganeze oxide (the metallic one), and ruby red glaze (the name speaks for itself). 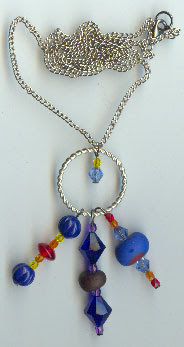 It is made in a similar way to that in which you would make the top of a pie in. 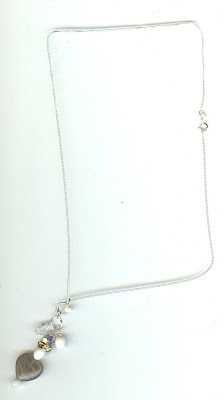 Another sterling silver charm necklace for sale! 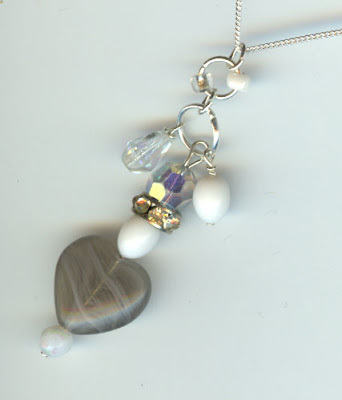 These two necklaces are both sterling silver chains with collections of beads that have been especially selected to make pretty little charms, the blue one also has a vintage blue button, and the other a grey heart. 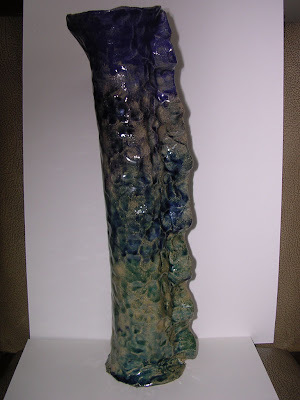 A long tall ceramic vase made at Friday night ceramics class. The pink colour needs to be more of a magenta, going towards blue, infact darker and lighter shades of this lettering would be good, not salmon or reddish pinks. 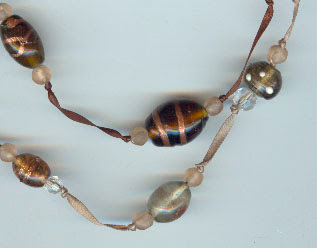 The beads could also be partly pink, and partly clear or white, patterned perhaps, or various shades of pink in one bead. 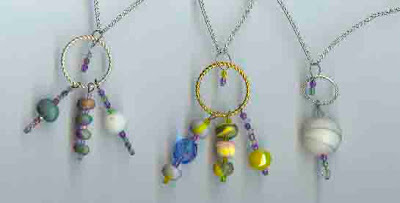 Here are 3 more necklaces made by Toby, for sale at £16 each plus p+p. 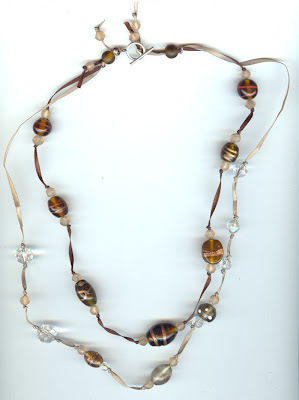 They can all be worn either as one long string, or doubled up as shown here to make two shorter strands. 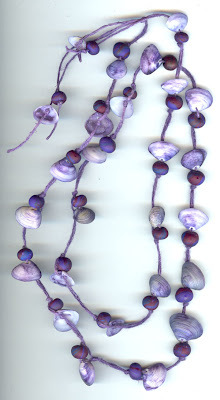 Firstly, knotted on purple hemp, are shells and Toby's handmade polymer clay beads. 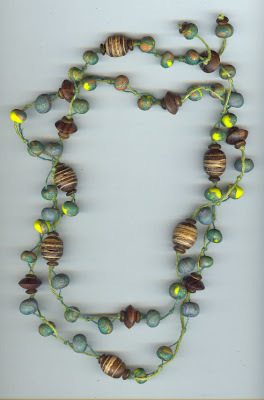 Second and third pics show various beads knotted onto ribbon. 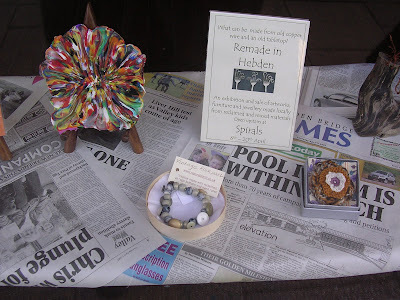 Last night (thursday) there was a remade in hebden exhibition in one of 'my' shops :- Spirals. 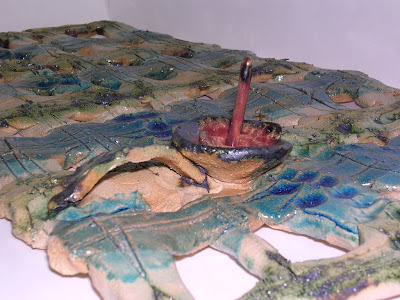 There was allsorts of things in there including things made from forks, old coins, and even old curtains! 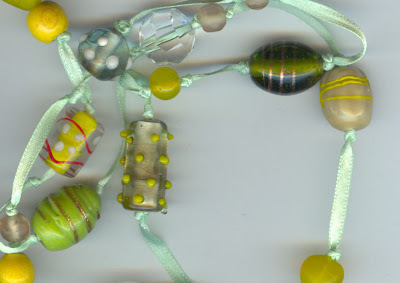 I had some of my Vintage Button Bracelets there, which were displayed in a glass case with candles and other button jewellery. To notify the 'general public' (or anyone not-so-general, that happened to walk past!) 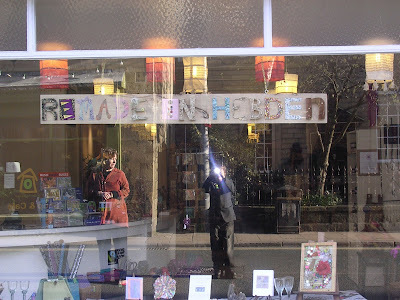 of this there was a sign in one of the front windows, saying 'remade in hebden', where all of the exhibitors made a letter to do with their work. Mine is the 1st R! 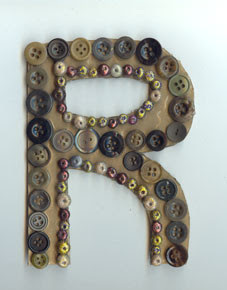 There is a photo of the shop front first, including a reflection of my mum, and myself, then a close up of my 'r'. 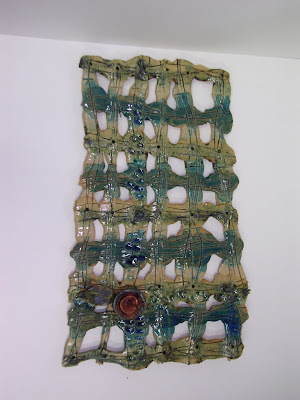 We made it with buttons and fimo beads wich represented what we had in that exhibition pretty well. 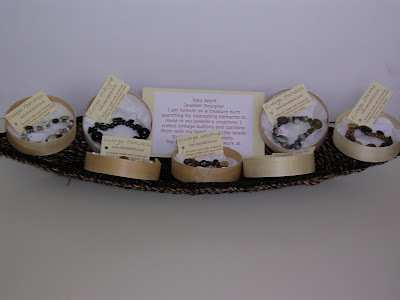 Next is a photo of the items displayed in the shop front, in the middle is a leaflet about the exhibition, and one of my bracelets. 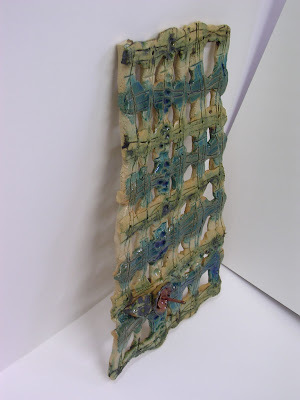 After that are pictures of the bracelets themselves, displayed in reclaimed boxes, and on a woven boat-thing, which was not used on the night. Well, I hope i sell something! 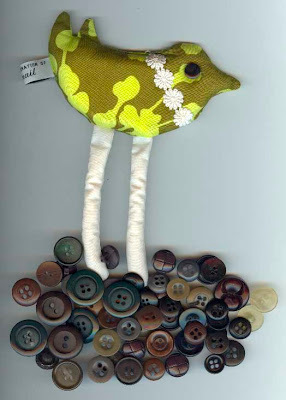 The package contained a whole boxful of buttons, lovely hand-stitched card and, a this pigeon. 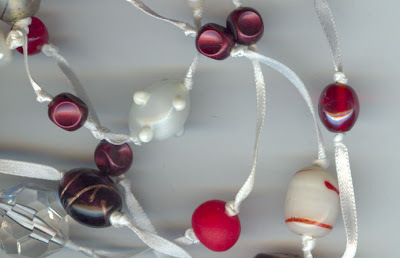 here is a link to ladysnail's blog where you can purchase these lovely birds, you can see my one in the bottom left!